Gary Twigg celebrates his dramatic penalty against Carrick Rangers. Pic by PressEye Ltd.
Gary Twigg’s arrival as a marquee signing in October 2012 led to fans reminiscing about Stevie Cowan, Garry Haylock and Vinny Arkins leading the Shamrock Park frontline. 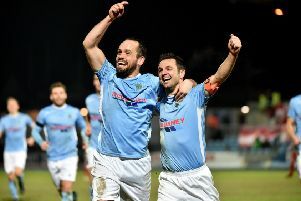 The capture of the Scotland-born forward was considered a significant deal for Ports boss Ronnie McFall in the tradition of strikers who cemented spots in the club history books by adding the finishing touch towards trophy returns. Twigg has yet to add to his haul of honours secured on the path to hero status at Shamrock Rovers. However, a natural ability to find the net showcased at clubs in England, Scotland and the Republic of Ireland before entering the Irish League has led to 50 goals in 100 Ports appearances. Twigg’s landmark strike on his century call-up arrived from the penalty spot - a career rarity - and managed to both carry the weight of responsibility and help lighten the tension. The last-gasp penalty against Carrick Rangers provided Portadown with a first Danske Bank Premiership success since August 22. Twigg’s return in front of goal in Portadown colours may prove as expected from a striker with such a rich track record. However, McFall is keen to highlight the overall contribution by Twigg. “In a situation like Saturday it comes to having the confidence to take it and Gary grabbed the ball,” said McFall. “Gary has not really taken penalty kicks in his career and Darren Murray remains our first-choice player from the spot but he was not on the field. “It was an important goal for the team and big result to get back on track and build confidence. “People can look like world-beaters when taking penalty kicks in practice but it is about stepping up when it counts in a match. “Gary has been outstanding this season and his game is about so much more than just goals. “People think of Gary as someone who needs service to score but should not ignore his all-round game. “He puts in so much work for the team and tracks back to help out the side.